“Intelligent Business Operations” (IBO) is now available on Cloud Appliance Library (CAL). Set up your own hands-on experience quickly with pre-configured smart process applications. What does the solution have? This blog explains what you would get as a part of solution “Intelligent Business Operations: SAP Process Orchestration 7.5 SPS 03 incl. B2B add-on and SAP Operational Process Intelligence 1.0 SPS 12” on CAL. What is in for customers/prospective customers? SAP is providing a free trial license to build sample smart process applications. Trial license is valid for 30 days from the day of creation of CAL instance after which the solution has to be unlocked. This can be done by purchasing SAP Cloud Appliance Library subscription package. It works on Bring Your Own License (BYOD) model. Please get in touch with your SAP Sales Representative or more information can be found here. Has access to pre-installed SAP Operational Process Intelligence and SAP Process Orchestration on HANA. Please note that CAL instance runs on Amazon Web Services (AWS). So Amazon would charge for hosting. Solution contains Industry specific showcase scenarios of Intelligent Business operations. This blog explains how to experience pre-configured smart process applications. Get access to “Intelligent Business Operations: SAP Process Orchestration 7.5 SPS 03 incl. 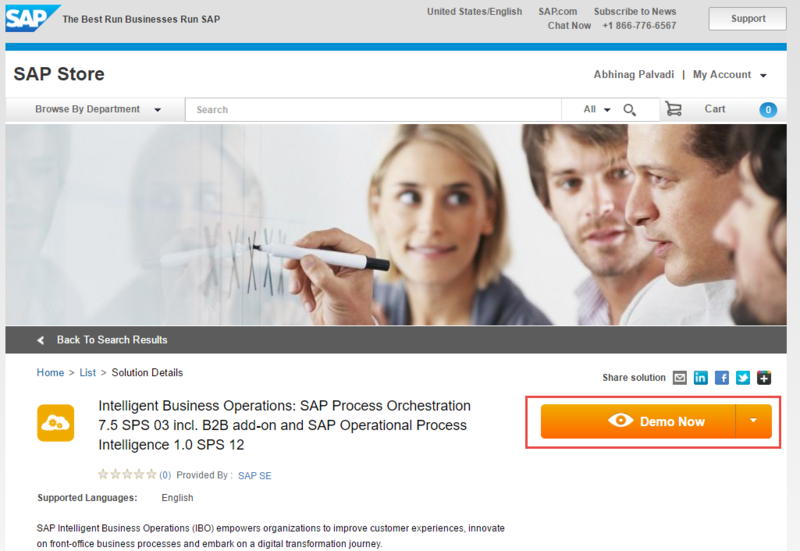 B2B add-on and SAP Operational Process Intelligence 1.0 SPS 12” solution on CAL via SAP Store or SCN. Go to SAP Store. Search for “Intelligent Business Operations” or click here for direct link. Click on “Demo Now”. This will take you to CAL. Look for “Intelligent Business Operations: SAP Process Orchestration 7.5 SPS 03 incl. B2B add-on and SAP Operational Process Intelligence 1.0 SPS 12”. Click “Get it for AWS”. This will take you to CAL. Login to CAL or create a user in Cloud Appliance Library. Get familiarized with key concepts of CAL here before proceeding further. Your CAL account has to be linked to an AWS account before creating an instance in CAL so that the charge for hosting an instance would be billed against AWS account. This blog explains how to link an AWS account to CAL and start an instance. Some of the most frequently asked questions are answered in FAQ page. I hope you enjoy the IBO experience. Love it. Great to see that it is accesable. I would thought recommed users to stop the service and change the instance type to just 30.5 Gb memory. For the integration part it seems to be running fine, I’m not sure how the OPI will work. just wanted to try it out. However, among many informations, the user name in the Getting Started Guide are missing. Instead of the Information there is an “Error. Reference source not bound. Who could provide the correct Getting Started Guide? Could please more specific? Where exactly do you see this error? May be a screenshot would help. Thanks. 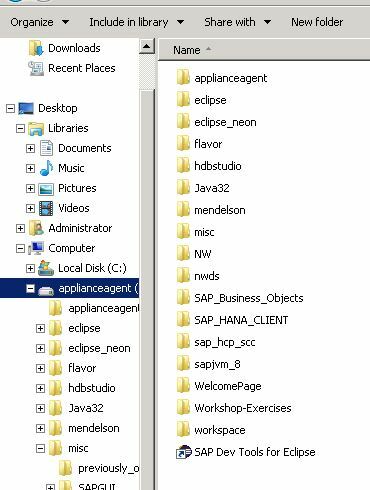 I am looking to try SAP Process Intelligence and got the instances up and running. I am unable to locate Administrator passwords to remotely logon using RDP or NWA. PDF documents refer to changing the SAP passwords but do not mention initial passwords to use. Can you please advise? Initial passwords for Administrator user or SYSTEM user would be the password which you would have provided as “Master Password” while creating an instance. Many thanks for the response. Yes, I have seen this statement in the FAQs and the relevant guides also but the activation process for the instance did not ask for a password. The activation worked in the background. Did I do something wrong? In actual, it should ask you for master password. Since the instance creation is on SAP Cloud Appliance library, you can post this question in SAP Cloud Appliance Library (CAL) . Is it possible to extend the licence as either free of paid for developers? I would like to use this as a personal dev box for prototyping. If paid, what are the estimated license cost(AWS cost excluded)? If anyone know answers to these, please share. Please mail DL_SAP_STORE_ORDER_NOTIFICATION@exchange.sap.corp with your requirement. My email bounced. Maybe this mailbox is SAP internal. Do you have an external facing email id? I was able to create AWS instance and were able to to do remote to the machine.. I tried setting up PI connection via HTTP but it asking user name & password.. I am not sure what is the user/pwd for accessing PI.. I am able to Remote the machine via master password. Could we also have a similar trial system for HANA Cloud Integration. Would be useful. Are you trying to setup PI connection using Swing Clinet? If so, it is not supported in AWS. Please see Question 4 in FAQ page (FAQ -Intelligent Business Operations: SAP Process Orchestration 7.4 SPS 11 and SAP Operational Process Intelligence 1.0 SPS 09). You need to use Netweaver Developer Studio to access PI. Username would be “Administrator” and password would be the master password you provided while creating the instance. NWDS is not allowing to enter “-1” as ESR Https Port parameter. Its throwing error ‘Enter a port number within…..ange (between 80 and 65535)’. I have unchecked ‘Secure Connection (Https)’. Please help. I am not able to connect PO sever from NWDS. http://bpmhost:50000 is also not opening (connection has timed out). Is the Server down? It would be helpful if we can update the FAQ and Getting Started documents. Please message me your email id. I will get in touch with you. I am facing the same issue like Nabendu Is this Free 90 Day trial version is expired. I just opened my account few days back. Please let me know. NWDS to PO Server connection is not working and facing the same issue. I will post the workaround once i resolve it on Nabendusen’s instance. Ping to bpmhost from windows host is timed out. It means the linux instance isnot up and running. 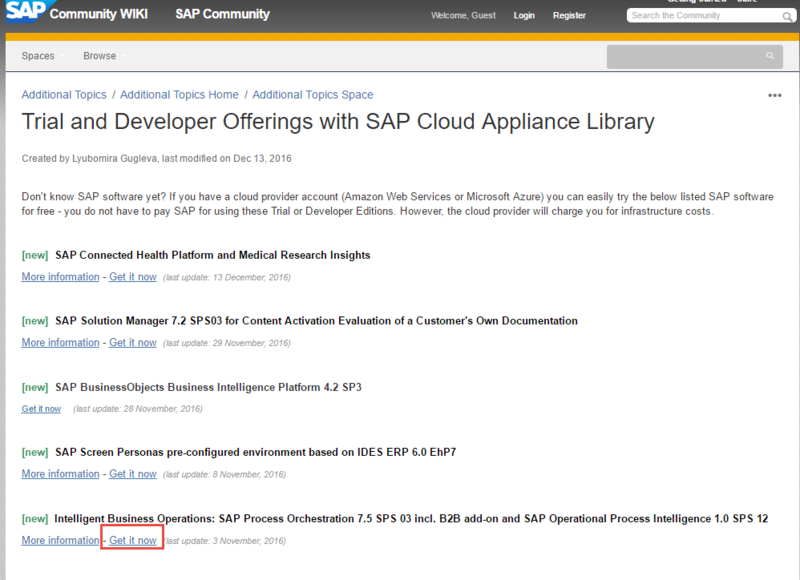 Please start a discussion in http://scn.sap.com/community/cloud-appliance-library/content?filterID=contentstatus%5bpublished%5d~objecttype~objecttype%5bthread . This is monitored continuously and someone from SAP would contact you soon. All the files and locations for the B2B “Exercise 5” is not present..
Any suggestions on where to get the files mentioned in the Exercise 5?